Posted April 14, 2010 & filed under Uncategorized. With the latest technology advances postage meters have become even more popular as a convenient way to pay for postage and track costs. Postage Meters are machines that are leased from commercial manufacturers in cooperation with the Postal Service that allow you to dial-up and download postage directly into the machine and then print it as you need it. Meters print postage meter indicia indicating the postage paid directly onto the mailpiece or onto an approved label. A particular advantage of meters is the ability to print the exact rate you need for your particular mailing. Q: What is a … Postage Meter, Base, Feeder, Sealer, Stacker, Tape Dispenser, Scale ? A: A postage meter is a mailing system that prints postage directly on the envelope (or an adhesive tape) for any type of mail — first, second, third, or fourth class; air mail, registered mail, special delivery, or other special services. A scale weighs letters or packages, based on the then-current rates, and indicates how much postage to apply to your mail piece. Interfaced models automatically apply that amount when running the piece through the meter. Some scales also allow you to rate shop to see if a different carrier is less expensive. FP rateguard™ insurance is available to guard against multiple USPS® rate increases. Q: Who sets postage rates ? A: The USPS® sets the rates and regulations we follow. Q: How would I purchase new postage for my postage meter ? A: You don’t need to go to the post office for this. New postage is downloaded directly into your postage meter at the touch of a button through FP’s Reset Debit Program. New postage can also be charged to your credit card. There is no need for sending checks and waiting days for postage to be added to your account. Q: What happens when the USPS® increases postal rates ? Q: How do we protect ourselves from future postal rate increases ? A: You can get protection against frequent postal rate increases through programs such as FP rateguard™. Q: Can I buy a postage meter ? A: No. Postage meters, regardless of manufacturer are rented – never owned. These postage meters are highly regulated by the USPS® because they hold actual U.S. mint. Q: What are the reasons for having a postage meter ? A: Printed postage has many advantages. It promotes a professional image for your growing business, gives you the ability to assign exact postage, saves trips to the post office, and allows you to send mail in different classes and track the costs of specific mailing campaigns — all of which can save your business up to 20 percent in mailing costs in the long run. Q: What happens if something goes wrong with my postage meter ? A: American Mailing Machines will be able to assist you with any problems you might have (Twin Cities Metro Area only). By law, customers are not allowed to open the meter component of the postage meter since it contains live postage. Q: What happens to the postage money in my old postage meter if I decide to switch to FP Mailing Solutions ? A: You would need to return your old meter to the old manufacturer. The money would be refunded from the USPS® for that account. Q: Once FP Customer Care adds postage to my account, how does the postage actually get into my postage meter ? A: The postage is debited from your bank account by the FP Customer Care department into your postage account. You set your postage meter automatically through the postage meter’s built-in, self-dialing modem. This process requires that your postage meter be connected to any standard analog telephone jack using a standard phone cord, which is supplied to you. You can also set up your account on reset debit instead of “on demand” debit so that when you reset your meter, your bank account is automatically debited without having to call FP. Q: What if I send out only packages, how would I get the stamp that your postage meter creates onto the package ? A: You would run a self-adhesive postage meter label through the postage meter and attach it to the package. Q: What will the actual “stamp” that the postage meter creates look like ? Q: What is IBIP ? A: The USPS® initiated the Information-Based Indicia Program (IBIP) to enhance the security of postage metering by supporting new methods of applying postage to mail. The information-based indicia (IBI) is printed by the postage meter or other forms of PC postage systems on mail pieces. The IBIP program is designed to give the post office greater visibility and security of mail. In addition, the use of the 2-D barcode removes levels of sorting within the mailing process cycle, which in turn will speed the delivery of a mail piece. Q: What is franking ? A: This is a term generally used in Europe in regards to postage meters. Franking is synonymous with stamping, metering, or posting. An envelope that has received postage has been “franked.” Here in the U.S, you will most probably hear the term “metering your mail,” where the word “metering” comes from the word postage meter. Q: What is a franking machine ? A: A franking machine is the same thing as a postage meter. This is a term generally used in Europe when referencing postage meters. Here in the U.S, they are referred to as postage meters, mailing machines, or mailing equipment. Q: Is a mailing machine the same thing as a postage meter ? Q: Why can’t I get my postage meter from the USPS® ? A: Federal regulations prevent the USPS® from competing with private enterprise. The Postal Service is a regulatory authority, determining product compliance with regulations and supplying product authorization on the basis of demonstrated compliance. The USPS® only regulates manufacturers that provide postage meters; they are not allowed to supply them. Q: What if I make a mistake when printing my postage with my meter ? A: Unused indicia or postage printed with your meter may be considered for refund only if they are complete, legible, and submitted within 60 days of the date in the meter stamp. These unused meter stamps are refunded at a postal retail window. For specific details, contact your local Post Office. Q: Will I be able to use my postage meter for all types of mail ? A: Postage meters are currently authorized for use on all mail services (except periodicals), including Domestic First-Class Mail® services, Priority Mail® services, Express Mail® services, Parcel Post™, International Mail, Presorted First-Class Mail discount services, and Extra Services. Q: What if I am sending a package or envelope that requires extra postage, how will I know how much to set the postage amount to on the postage meter ? 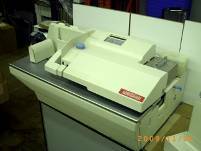 A: Postage meters come with postal scales, which are often integrated into the postage meter itself. Simply place the envelope or package on the scale, and the correct postage is determined and set immediately. A good example of a postage meter with an integrated scale is the FP mymail™ 2. Q: Where can I buy supplies for my new Postage Meter ? A: Call American Mailing Machines at 952-894-4204 or go to the American Mailing Machines Online Store. Q: Is there a store to buy Mail Room Furniture ? A: American Mailing Machines is your one stop shop for all of your Postage Meter needs. Please visit our Online Catalog for Mail Room Furniture. Posted December 1, 2009 & filed under Uncategorized. If you are looking for a great deal on an envelope sealer, check out our reconditioned line. All of our reconditioned sealers are in “brand new” condition. Our FP 75/8500 sealer can handle up to 100 envelopes per minute. This dimensions of this machine are: (H) 9″, (W) 16″, (L) 33″. This machine weighs 55 lbs. For more information related to this machine, please fill out a quote for the FP 75/8500 envelope sealer by clicking here. Our AS Envelope Sealer will run up to 200 envelopes per minute. The dimensions of this machine are: (H) 8″, (W) 16″, (L) 35″ and weighs 60 lbs. This model was originally sold new for $6,500. Click here for a quote on our AS envelope sealer. Our Pitney Bowes U560-70R envelope sealers have been reconditioned to brand new. This machine operates at a high speed of up to 175 envelopes per minute and weighs 170 lbs. This sealer originally sold new for $10,500. Click here for a quote on our reconditioned Pitney Bowes U560-70R.